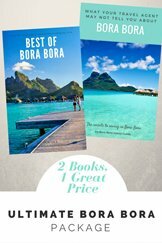 Here's need to know information on Bora Bora travel and island geography. Click on a topic to fast-track to that section. Bora Bora is a tropical island in French Polynesia, located in the middle of the Pacific ocean, halfway between Australia and the USA. 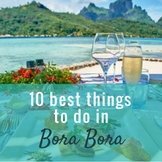 Find out exactly where Bora Bora is located. 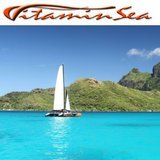 Find out if you require a visa for your Bora Bora travel and other useful travel information about Tahiti currency, Bora Bora's power voltage, internet access, and phoning home. 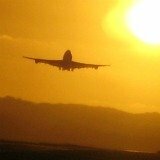 Find out how long international flights to Tahiti take. 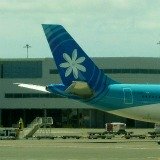 Read more information on choosing the best Tahiti airfare. 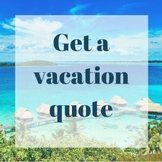 Know which specialist Tahiti travel agency can get you an all-round attractive deal for a superb Bora Bora vacation. 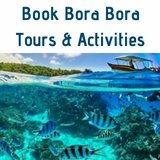 For a good overview of Bora Bora travel information including Bora Bora's timezone, visit our information on Bora Bora travel page. Bora Bora has a main island surrounded by smaller islands. This makes getting around different and fun! Boat is a main form of transport. Find out how to get around the island to the airport, restaurants, resorts and activities; by boat, bike, scooter, public transport, taxi, car hire and shuttle. 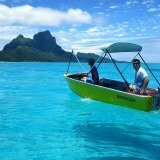 There are also many fun ways to get around Bora Bora! Boat is a main way to get around! 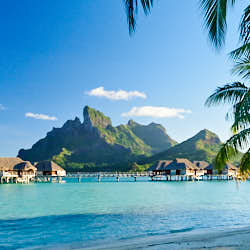 From Tahiti, flights to Bora Bora take 45 minutes and will be the most beautiful you have ever experienced. 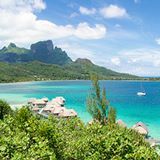 Everything you need to know about Bora Bora flight details, how to get discount prices, where to sit on the plane, baggage allowances, cancellation requirements and where to stay near the Tahiti Airport is on the flights to Bora Bora page. 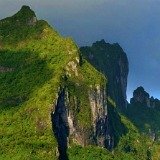 Here is useful information on connecting from your Tahiti flight to Bora Bora flights. 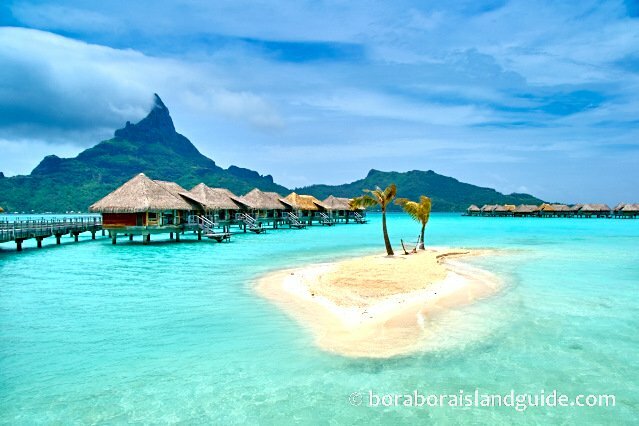 Bora Bora has a permanent population of around 9000 inhabitants. About 5000 live in the main town of Vaitape and others are in the villages of Anau and Faanui. The spire of a church marks each village. To make a long distance call from Bora Bora you must purchase an international phone card. These phone cards can be used to call home from all of the Tahitian islands. If you have a GSM phone you may be able to have international roaming on your phone. If your phone is unlocked, an affordable way can be to buy a sim in Tahiti or buy a international sim card. Before using a phone at your resort, check the charges for calls. Don't assume that calling another number in Bora Bora will be billed as a local call. Calls between motus may be billed at long distance rates. Internet access is available in Vaitape at the Aloe Cafe. They have several computers (both Mac and PC). 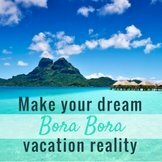 All the Bora Bora resorts can provide internet access. Their policy on charging varies. Some offer free wi-fi in the rooms, others charge. Many of the resorts charge for in-room use but offer free internet in their business center or near reception. So ask when you are checking in. 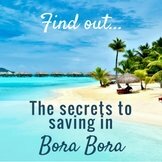 You will also find information on Bora Bora resort internet policy on the website of each. Western Europe. Many of the Luxury resorts have American plugs in their bungalows. All the resorts have a US 110 volt shaver socket in the bathroom that will recharge camcorders and cameras without the need for an adapter. For specific information on Bora Bora resorts' power plug voltage, check on their web sites. You can usually borrow an adapter from your reception, but it is best to bring your own, as they may be all on loan to other guests when you need one. French and Tahitian are the official languages. 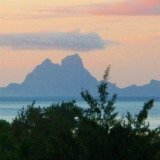 Find out about the languages spoken in Bora Bora. English is widely spoken in tourist areas. If you make an effort to learn a few commonly used Tahitian and French words, Polynesians respond warmly. The local currency is the Pacific Franc (CFP). You can exchange money most easily at Faaa airport in Tahiti before coming on to Bora Bora. There are several banks with ATMs in Vaitape, Bora Bora's main town. Bora Bora airport also has an ATM. The United States dollar is accepted in some places. As a general guide 100CFP is approximately $1 US. 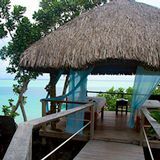 Bora Bora weather is divided into two seasons: the wet season (summer), and the dry season (winter). Visit the Bora Bora weather page to find out what weather to expect when you're planning to go. 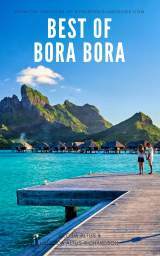 Bora Bora is a small island, 29.3 sq km (11.31 sq mi), set in a turquoise lagoon that is sheltered by a surrounding string of coral motus (small islands). The steep, dramatic profile of Mt Otemanu makes a big impact. It's volcanic peak is visible from just about anywhere on Bora Bora and makes a stunning backdrop to the blue lagoon and white sandy beaches. 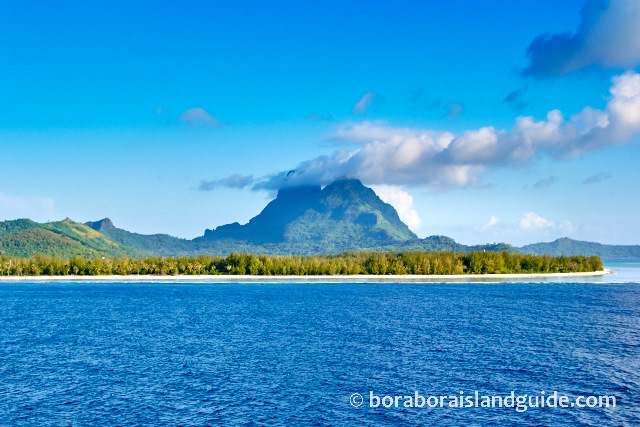 Here's more about Bora Bora's geography and the wildlife to be found on the island. 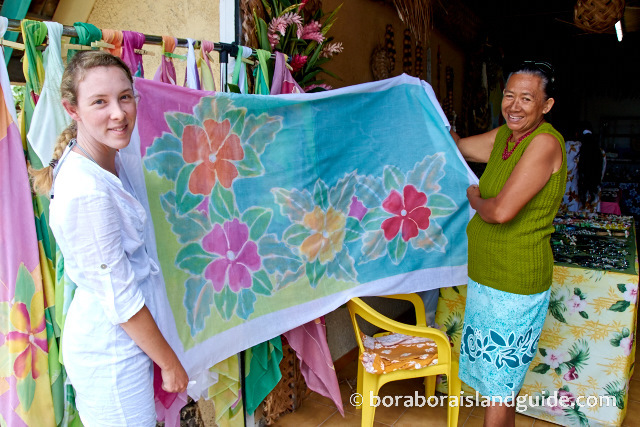 Discover the best places to shop in Bora Bora and the Tahiti souvenirs to look out for. Tahitian pearl jewelry is the most special memento you can take home. Here's all you need to know to make a great choice when buying Tahiti pearls. 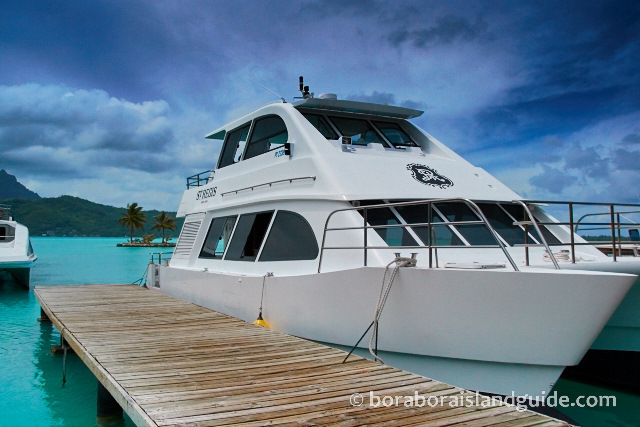 Make sure you get information on Bora Bora excursions while planning your vacation. 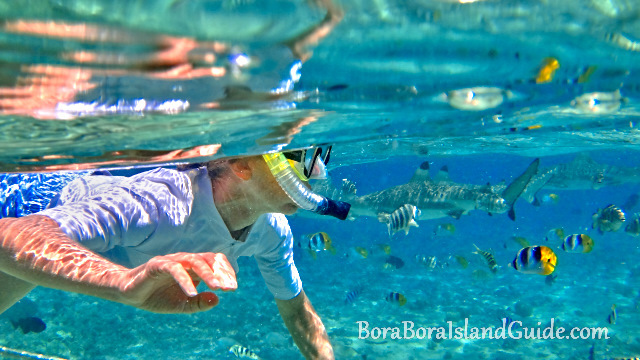 A brief, comprehensive overview of all activities can be found on the information on Bora Bora activities page. The legendary lagoon is a sublime playground for a wide choice of water activities. On the main island there are exciting things to do too. 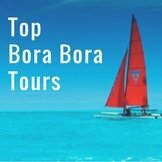 Visit the Bora Bora tours page to see all the on-land things to do on Bora Bora.